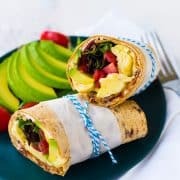 This California Breakfast Wrap is great for breakfast or lunch! 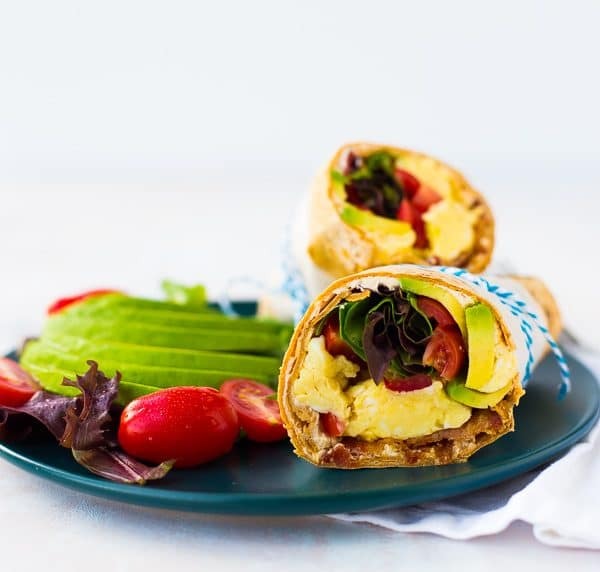 The salty bacon, creamy avocado, fresh tomatoes and filling eggs make it a perfect meal! Last week was a hard week. Not hard in the major way (death, injury, etc) but hard in the parenting department. Just hard. There are many stories I could tell, and many venting texts to my lucky husband, and maybe a few tears involved. Okay, maybe tears nearly every night. It was just that kind of week. I’d go into details but I want to protect my sweet little ones (actually, if we’re being honest, it’s not “ones,” it’s just ONE) and their privacy. Parenting is hard and this week I was pushed to my limits. Ben worked a ton too — school officially starts this week so he had a million and one things to do in preparation for the arrival of students and teachers. He has Fridays off in the summer (that’s right, principals work all summer long!) and we thought he was going to have this past Friday off. Well, turns out work piled up and he had to work. You know that phrase salt in the wound? Well, that’s what this felt like. I know, first world problems. It was just an ultra-tough week and Thursday night was my light at the end of the tunnel. Then, that changed to Friday at 5 (early for him!). And then he called. A teacher resigned (to cut her commute), and they had to do interviews. He had to stay until 5:30, so he wouldn’t be home until at least 6. And he maybe had to work Saturday. And then I may have cried again. Just a little though. Momma’s gotta stay strong…or maybe I just ran outta tears. This is also, as a side note, no reflection on Ben. He’s a hard worker with a job to do (and he does it so well! ), and he’s an amazing husband and dad. Not a gripe about Ben, just a gripe about a rough week. So here’s to hoping this week is better. 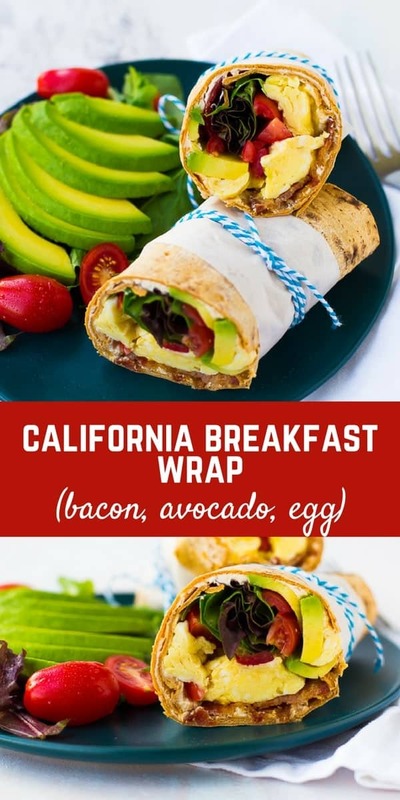 I think it should start with a California breakfast wrap, because if we’re being honest, any week that starts with bacon can’t be all bad. 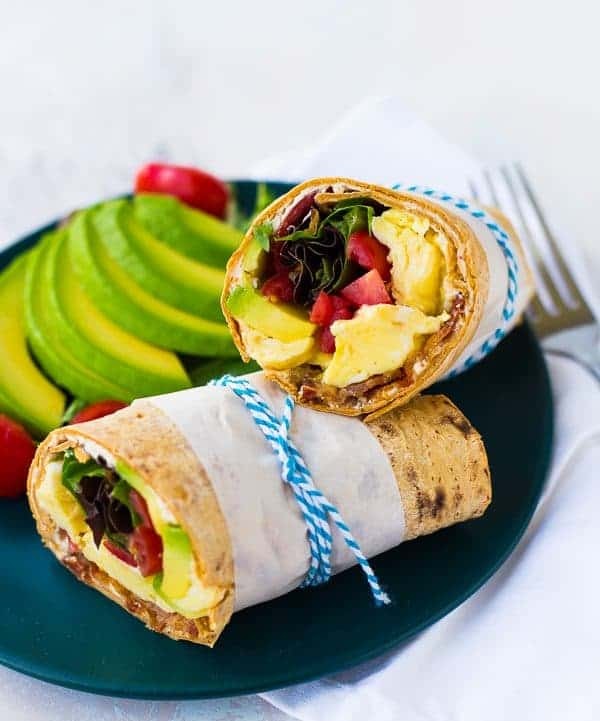 Actually, this wrap has many of my favorites. Eggs — I live for eggs. Rarely a day goes by when I don’t eat a couple of eggs. Bacon – duh. Fresh tomatoes — they’re SO good this time of year. Avocado — silky, smooth, decadent avocado. Greens — another thing we go through like crazy in the Gurk family. Cream cheese — the glue. It’s all wrapped up in a deliciously soft Flatout wrap and tied together with a cute blue string. The string is optional, but adorable. 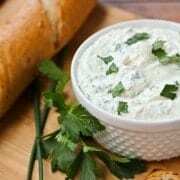 Spread cream cheese on Flatout Flatbread, all the way to the edges! 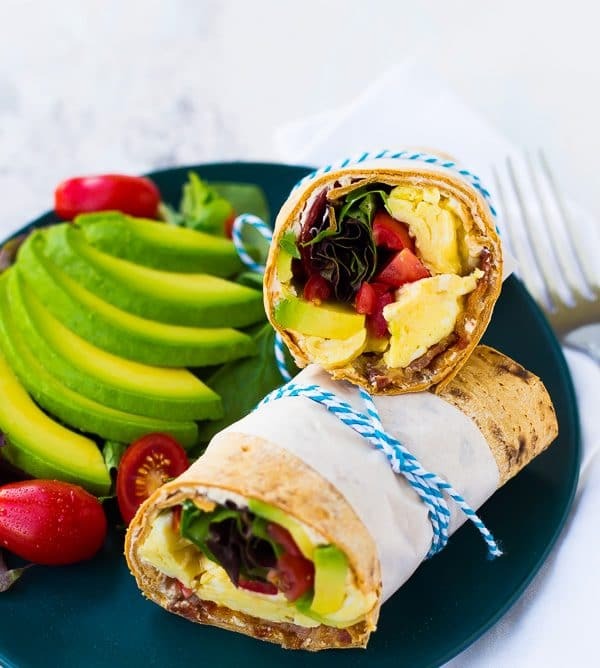 In the middle of the wrap, add bacon, eggs, avocado, tomatoes. Roll up and enjoy! 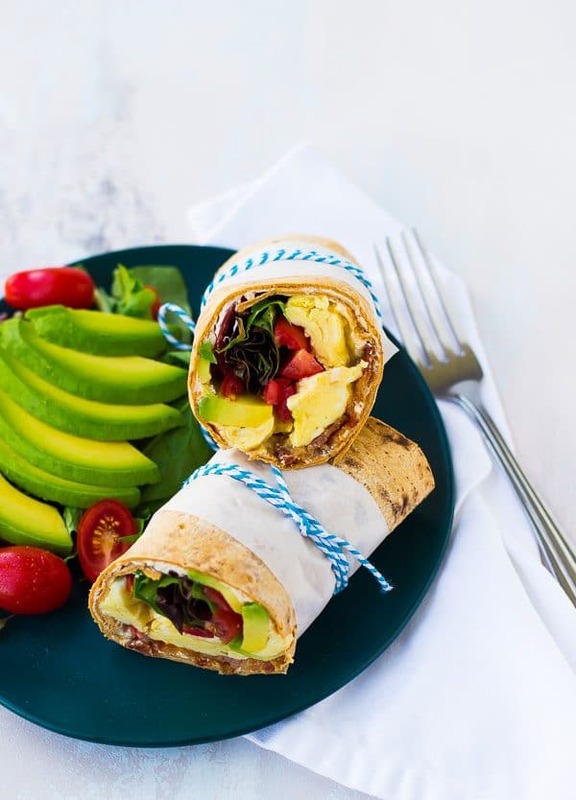 Verdict: I love this breakfast wrap. I think I’ll fry up some bacon today. Husband’s take: Ben isn’t usually all-aboard the cream cheese train so I didn’t anticipate him loving this but he LOVED it. Win for me! Changes I would make: None are necessary but this is super flexible, you guys. If you want to use turkey bacon, go for it! I’ll even try not to judge you for it. 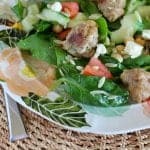 If you want to use spinach instead of mixed greens, do it! If you don’t have avocado, shed a few tears, but make this anyways. It will still be great! If scrambled eggs aren’t your jam, give it a go with a couple fried eggs or sliced boiled eggs. 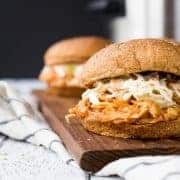 What I’m trying to say is you can easily make this recipe your own. 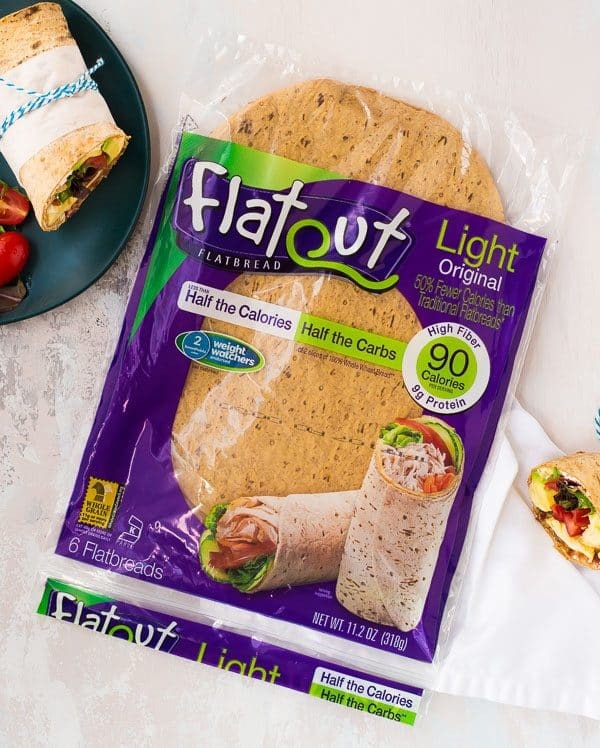 Disclosure: I’m excited to partner with Flatout Flatbread to bring you quick and delicious recipes like this breakfast wrap. I have been compensated for my time but all opinions are always my own. Thank you for supporting Rachel Cooks by reading about brands we love and use in our own home.